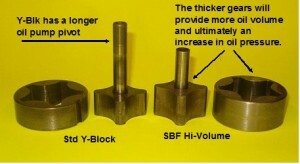 Although I normally wouldn’t advocate a high volume oil pump for a run of the mill Y block (1954-1964 Ford 239, 256. 272, 292, 312), I did run into a situation where the use of one would at least be a temporary fix until a new engine could be built to replace the current one. Because a high volume oil pump for the Y hasn’t been available for awhile, the basic plan called for building one using currently available parts. 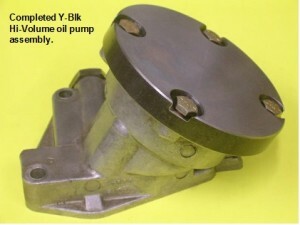 Before I actually get into the modifications required to make a high volume pump for the Y, I’ll give some background relating to the engine for which this particular pump was being built and why a high volume oil pump was deemed necessary. This story starts with a bored to the hilt 312Y (3.925” bore) with old school popup pistons that was assembled by a Dallas area ‘speed’ shop and then this particular engine laying in wait for a number of years before the car was actually ready for it. When the engine was ultimately fired off, the cold oil pressure seemed satisfactory but there was a serious rear main leak so the engine wasn’t allowed to get sufficiently warmed up. This is where I come into the picture as I was approached to help fix the rear main leak. While the pan was off, I casually checked the rod side clearances by merely doing a hand feel of them. And of course I find something to raise some concern; the rod side play on the number one rod journal seemed excessive and upon measuring it, there was 0.081” clearance. The other three journals were acceptable in that they each had 0.025” or less. After some discussion, it was decided to go forward, fix the rear main seal, and get the car on the road with plans to eventually replace this engine at the earliest opportunity. The rear main oil leak was officially fixed at this point but upon driving the car enough to get the oil hot, the oil pressure was dismally low even at highway speeds. Although it’s determined that the excess rod side clearance is not the reason for the low oil pressure, it’s now questionable exactly what other clearances were not maintained within acceptable tolerances in this engine during its initial buildup or if the block itself has some internal problems. If it wasn’t for the low oil pressure, there would not have been any indication that anything was wrong as the engine runs very well with no unusual noises and has plenty of power evidenced by it being able to light up the rear tires at will. All the right parts are obviously there for performance in the form of increased compression, lots of cam, MSD ignition, Blue Thunder intake, Demon carb, and ported heads. But the low oil pressure is bothersome and having a new engine ready to drop back down into the engine bay was still a good ways off. After ruling out the oil pump, the rubber seal at the inlet of the oil pump, oil viscosity, gauges and the oil filter, I suggested just increasing the volume of oil to get the pressure up into a safer zone as an interim measure. Making a high volume oil pump for the Y is not difficult once it’s recognized that the majority of Ford oil pumps have the same diameter gerorotor gear set. A particular nuance to watch out for is the size of the hexagon oil drive shaft which for the Y is ¼” but is conveniently the same size as the Fe (360/390/427), SBF (289/302/351C), and OHV (368,302,332) engines. At this point, the basic plan revolves around using a stock Y-Block gerorotor oil pump housing in conjunction with a longer than stock gerorotor gear set and a fabricated cover that will compensate for the longer gears within the stock housing. The whole key here is to keep it simple, keep it repeatable, and keep it inexpensive. As can be surmised, inexpensive is a subjective term especially when dealing with these older engines. 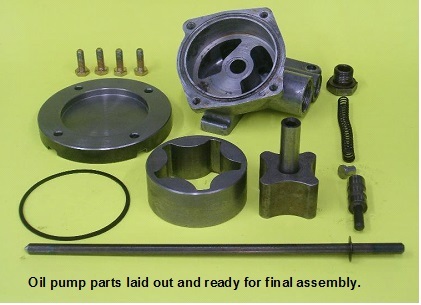 A high volume oil pump for a 289/302 Ford (Melling P/N M-68HV) was purchased which supplied the necessary longer gerorotor set for this project. 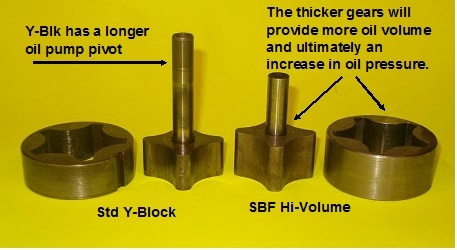 Upon comparing the new inner and outer rotors with the stock Y components, the SBF rotors are 25% longer which will effectively increase the oil volume by 25%. Upon comparing the various pump parts, it becomes obvious that the pivot shaft protruding from the SBF inner gear is approximately 1.115” shorter than the one in the Y unit. This makes the stock Y oil pump drive shaft that much too short and is corrected by using the oil pump drive shaft for an OHV Ford engine (368 Lincoln, 302/332 OHV truck) rather than try to relocate the longer center pivot shaft from the Y rotor to the SBF rotor. 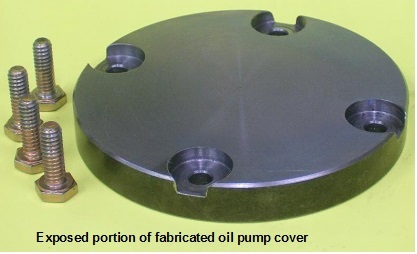 The OHV oil pump shaft (Melling P/N IS-60A, 9.167″ overall length) was merely shortened 0.100” in which to make the total length to the distributor correct. Next on the list is to measure the inside depth dimension of the Y oil pump housing where the rotors reside, measure the SBF rotor thickness, take the difference of these two values, and add 0.003” to the derived value. This is the depth of the hole or recess that must be machined in a new cover to accommodate the longer gear set while providing the prerequisite 0.003” clearance between the gear and the cover (rotor end play). Another option would be to just machine a spacer that would make up this required distance and use the stock oil pump cover but this ultimately creates another place for an oil leak. These engines are already noted for marking their territory so rather than compound the issue, I stayed to the original plan and simply machined a cover with a recess in it to compensate for the longer gear set. 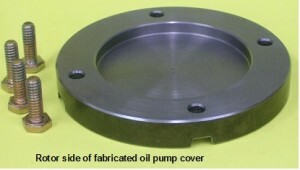 The new cover was fabricated from a ½” thick piece of 4” diameter cold roll steel and machined with a 2.634” diameter recess that measured 0.226” deep. An appropriately sized piece of flat plate steel could have also been used but a bar of cold roll was just conveniently at hand. After placing the machined cover on the oil pump housing and over the protruding rotors, transfer screws were used to mark the location for the cover’s bolt holes and the cover was then drilled to accommodate the required four ¼” X 20 cover bolts. While the pump was completely disassembled, the oil pump relief valve spring was also shimmed with a 0.110” spacer to raise the cold oil pressure limit. Upon assembling the pump, it’s imperative that the rotors turn freely within the pump after torquing the cover in place; if they don’t, the reason why must be determined and corrected. Prior to final assembly, clearances within the pump were checked using the following guidelines. 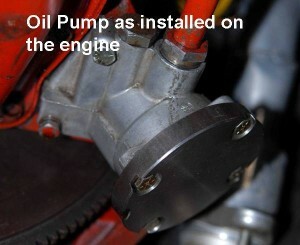 The pump was installed on the engine and did indeed increase the hot oil pressure. The following table compares the engine oil pressure with the stock pump versus the pressures obtained with the hi-volume pump.